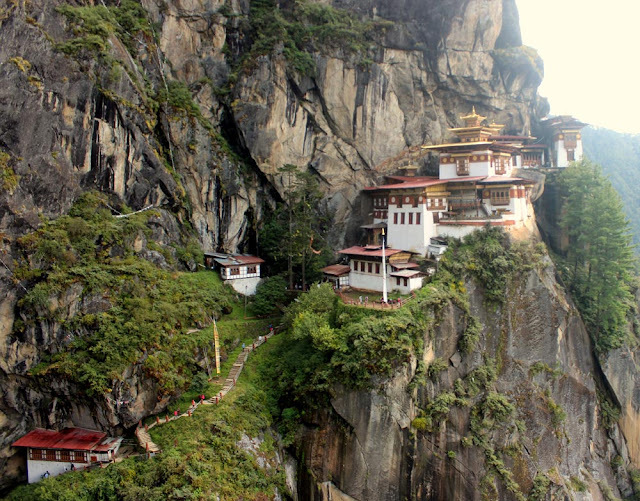 How difficult is it to climb Tiger's Nest in Bhutan? Before I ventured to climb to the Tiger's Nest Monastery in Bhutan, I searched the internet to find the level of difficulty. All that I got was subjective information like if you are an experienced trekker then it is not so bad, or if you are a novice, it's very hard and so on. There were no photographs actually depicting the climb. 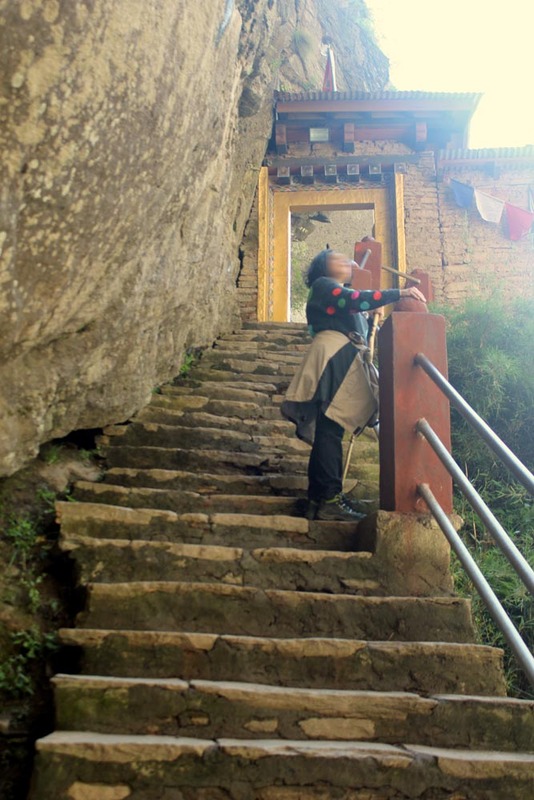 In fact I got some erroneous information that the steps to the temple had no railings, and I almost gave up the idea of the climb. 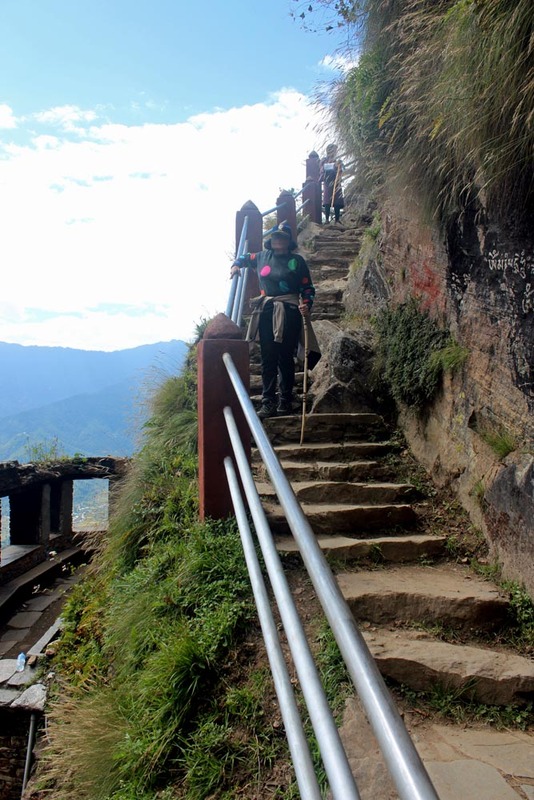 Once we reached the bottom of the mountain, our guide assured us that there were railings and told us that these railings had not existed some years earlier. When I climbed to the Tiger's Nest temple, I took photos for the explicit purpose of providing the right information to those who want to do this climb. This what the monastery looks like from the bottom, before you start the climb. The small white building at the top half of the photograph is the actual temple. There are two mountains to climb. You have to go up one mountain (the base from which I took this photo) and then climb down again. Then you have to climb up an actual cliff to the temple, but from here on there are steps, and this makes it easier. The way up the first mountain is steep. 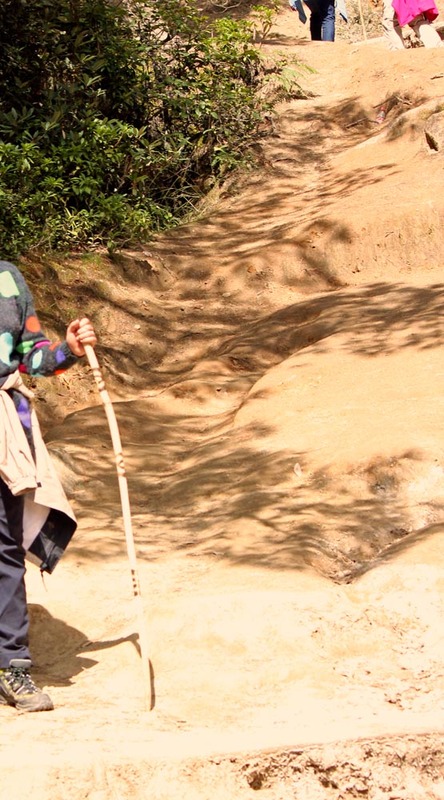 Take a trekking pole or stick which is available at a small price at the bottom of the mountain. The stick is a must and preferably if you can, take two sticks. Loose rocks large boulders and sudden elevations are hard to do. 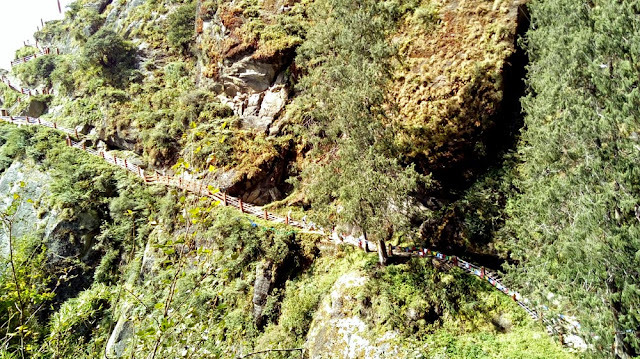 It took me, an inexperienced trekker, a little more than 3 hours. It's said that the track is slippery in the rainy season so if you are serious about making this climb, do not go in the rainy season. At the half-way point there is a cafe where one can have a cup of tea. Only tea and biscuits available here. Best not to stop here as the monastery is shut for lunch from 1-2 pm and we wanted to reach before 1 pm. Please take a bunch of fruits and nuts (and of course water too) because there is no food available at the monastery. It is possible to take a pony up to the half way point. The ponies always walk on the edge so it is scary but if it is dry then it is fairly safe if you are comfortable riding. Avoid ponies if the track is wet. Also avoid ponies if you really want to get the satisfaction of the climb. I preferred to walk. After the cafe comes the second leg of the journey. It's similar to the one in the photograph above, with even more very very steep parts. This second leg of the climb can take half an hour at least. Then you come to the third leg of the climb, and from here you go down. There are steps which take you down the mountain you just climbed. Some parts are very steep. Already tired with the exhausting two hour climb, these can be a relief, if your knees are good! Without good knees you can take the help of two sticks or a least one. There are good sturdy railings so do not worry on this score. However, best not to lean on them. 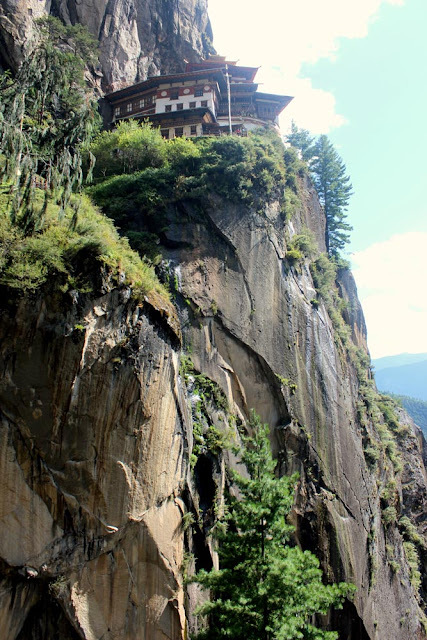 A view of the tigers nest monastery as you come near the bottom of the first mountain. After you reach down, you reach the area inbetween the two mountains. 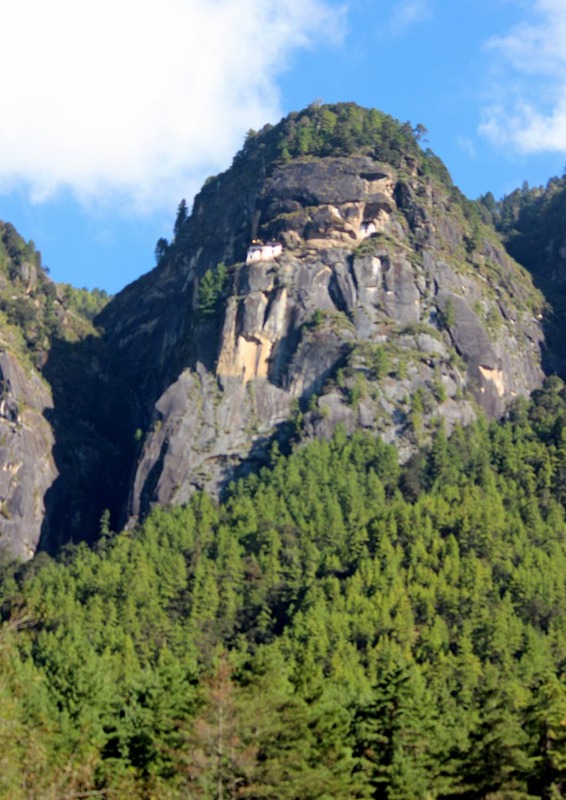 The photo below depicts what it looks like between the two mountains or cliffs. And no, that little bit of white you see is not the actual temple. There is still a very steep way to go! Still a long way to go! But there are steps to go up so it is okay. Steps with railings. 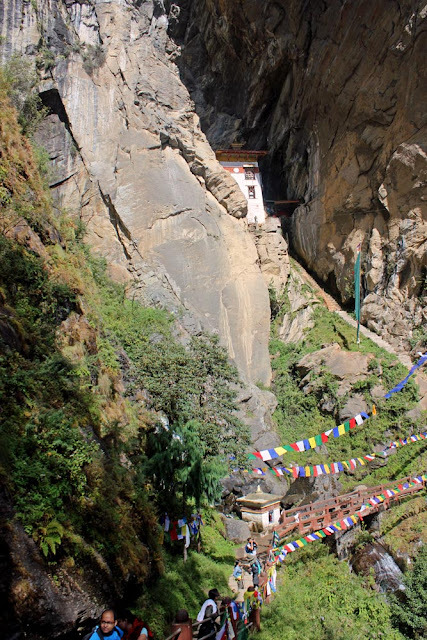 For a novice like me it took about about 3 hours to reach right up to the temple, from the start to the finish, with short stops to take my breath! It can also take three and a half hours, depending on whether you stop at the half way point. My recommendation is not to stop here more than a few minutes, as you are likely to be so tired, that you could be tempted to give up! The way back from the temple takes about 4 hours, with a longish half hour break at the cafe. It's easier on the way down, at least easier on one's heart. But not on one's knees. Carrying two sticks on the way down helped me as my knees are not that great. Luckily our guide found another stick in the forest. Take plenty of water and high protein snacks like cheese and nuts. There is no lunch available there. Use caps to protect your head as the sun is strong. 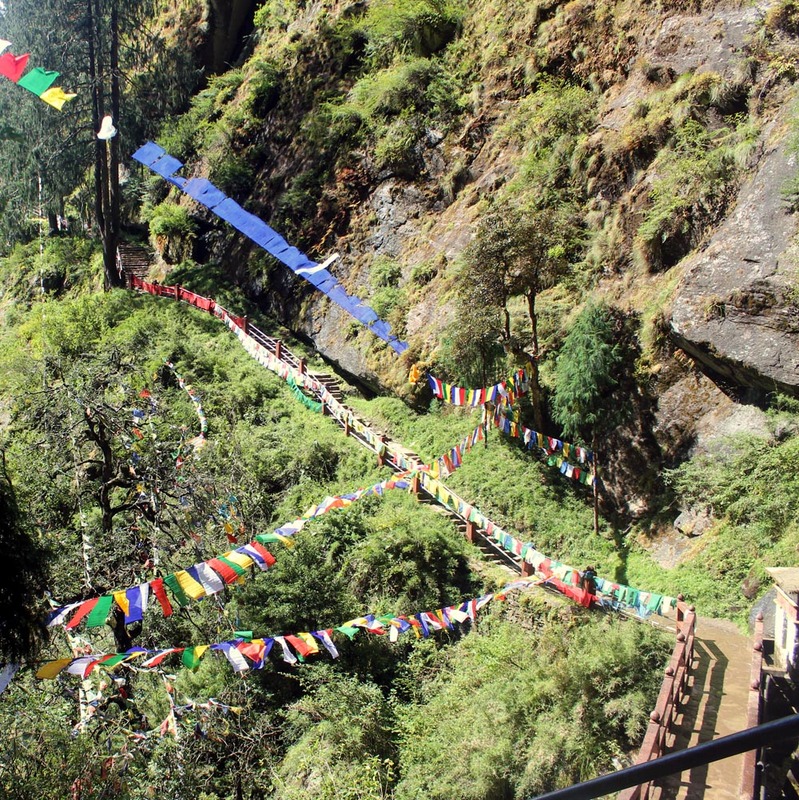 Do this trek after a few days in the high altitude area. We did it at the tail end of our trip, after about 8 days. This way you are used to the altitude. If you are reasonably healthy you can do it. Take your time if you are not used to climbing. It's okay to take even 4 hours to climb. The main thing is to do it! Also, if your companions are athletic and go up faster than you (it is possible to climb in 2 hours if you are athletic), then you could be tempted to give up. If your companions are less motivated than you, and decide not to go up to the top, then too you could give up. So be prepared to go it alone. Take a guide with you. The main thing is that if you make this wonderful journey you will never regret it. The experience is almost spiritual. It will stay with you all your life.